Since its debut in 1988, the Tang Dynasty complex received over 5.5 million guests from around the world. This is also a place where dignitaries and visitors to Xi'an congregate to partake of the splendor of the Tang Cultural experience. In fact, overseas visitors commented that their evening at the Tang Dynasty complex was perhaps the most entertaining and enriching experience in their journey around China. 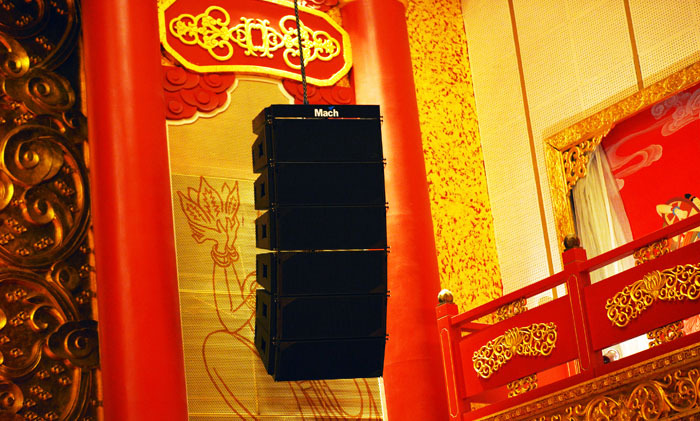 In 2013 The Tang Dynasty would like to enhance the quality of the sound system, so they compare many different brands of professional speakers for demonstrations, after months of demonstrations contrast they chose the MACH for their venue audio system. This project used a total of 12 Mach WLA-108 line array speakers, each six calculated accurately by hanging on both sides of the stage in the theater. In addition, the system design also incorporates Mach just C Series 4 CW-218 dual 18-inch subwoofer and four CM9 full-range speakers, that will made the sound for more fuller and uniform, perfectly for the various theater performances.